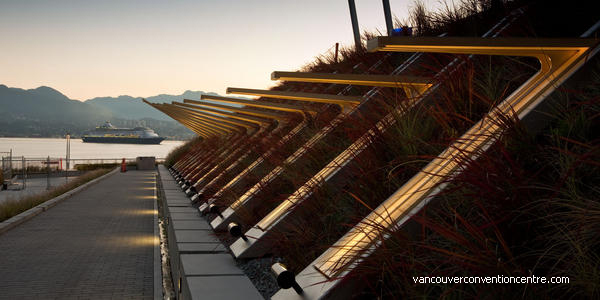 “Line of Work” is a memorial for British Columbia workers composed of text-etched laminated wood and stainless steel by Jill Anholt on the exterior of the Vancouver Convention Centre West, just below Jack Poole Plaza. Individual occupations are carved into the wood to reflect the diversity of workers’ skills. The area also includes plaques to workers who have been injured or killed due to workplace accidents or disease. It is the site where workers and families gather each year on the National Day of Mourning, April 28.